When the aviation business did not give him as much fame as he now has nor the empire and fortune he currently controls, he turned his ineptitude into a successful career that has not only furnished him with the foregoing but even more. Todd Hoffman is the creator of the Discovery Channel TV show, Gold Rush, which premiered in 2010. For eight years, he struck gold in more ways than one; on the ground and on TV. Besides, the show has provided us with a cocktail of adventure, enlightenment, entertainment, and exploration. Along with his six friends who equally lost their jobs, and all of whom had no prior experience in gold prospecting nor mining, Todd Hoffman, inspired by his father’s gold mining adventures in the 1980s, saw beyond a piece of property in the Yukon territory in Canada to a mine of opportunities. 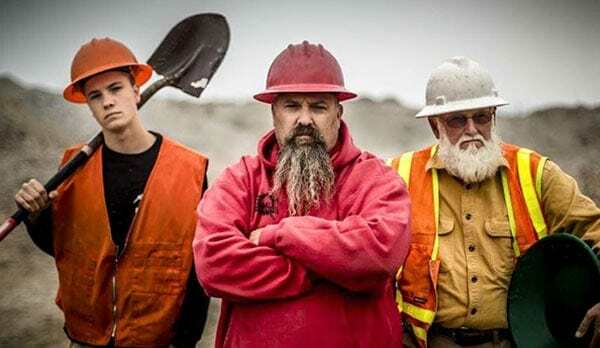 Now in its 9th season, with over 200 episodes, the show focuses on the mining of gold placer deposits by various teams of miners, through their family-run mining companies. However, Hoffman’s 316 Mining company have cut across both South America and western North America. After eight seasons, the end of an era for the network’s highest-rated series and one of the most popular reality shows in cable TV history came. Todd announced on Gold Rush: Live that Season 8 would be the last for him, his family and the team. Where is he now? What adventure has he taken on this time? These and many more are revealed in this piece about the TV star. Read on. He was born on the 12th of April, 1969, in Sandy, Oregon, the United States. In the midst of America’s Great Recession, and having lost his investments in the aviation sector, Hoffman thought that one more risk wouldn’t do much harm. Out of desperation, he rallied six of his Oregon friends who have also been affected and even lost both jobs and businesses and are seemingly on the verge of giving up. The group went after gold. Risking their lives, health, resources, and possibly all, they headed to Alaska. With about $200k left to his name, Hoffman and his crew went into the business. In turn, he put up a show about inexperienced men mining gold together and managed to pitch it to the network. Though he lost nearly all: health, money, courage, and friends who thought he was stupid, in the first season, Gold Rush became an instant hit afterwards. The men learned through trial and error, on the job. What appealed to viewers of the show is what it represents: the triumph of tenacious underdogs against the seemingly overwhelming forces of global economics. Fans watched as Todd Hoffman and his crew battled the desert and the terrain of mining different parts of the world. Even though things have gone rarely smoothly, moments that were happier than others, they trekked on — with the prospect of gold in their future and in small part, giving hope back to America with their journey. They stuck to their course, learning through every curve as they go and getting better at what they do. He has had to deal with different guys with different personalities, age and rivals like Parker Schnabel who was only 15 when the show premiered but manages to bring in more gold at the end of every season. Hoffman finally retired from prospecting, and together with his family and team, left the shores of Gold Rush after the eighth season. Todd Hoffman has made quite some mint in prospecting and mining, despite the trials and tribulations that came with the adventure. His small-scale mining operation, as well as TV career, pulled millions of dollars’ worth of gold from the ground in Alaska, the Klondike and Colorado. According to reliable sources, the reality star’s net worth is pegged at $7 million. Now that he’s entering into other career streams, this amount would sure appreciate in future. Todd Hoffman was raised alongside his sister, Tamara by their parents, Jack and Georgia Hoffman in northeast Portland. His father previously mined for gold in Alaska for a number of years and after the price of gold went down, he put his dream on hold. However, when his son came up with the gold mining idea, he decided to give that dream a chance again, joining the Hoffman team on the show. Growing up, Todd spent a couple of summers helping his father work in the ’80s. When he lost his job years later, he decided to also prospect and mine gold. Being a Christian, he believed that Gold Rush was a vision from God and said that the dream gave him hope and something to latch onto when it seemed all hopes were lost. Hoffman is a family oriented man and succeeded in staying married through the years of his arduous adventure. Sometimes, he lived without his family 6-7 months in a year while prospecting and shooting the series. He has been married to his beautiful wife, Shauna for over two decades and the two are parents to their children; son Hunter, and daughter Hudson. As much as he can, he tries to inculcate family values and work ethics into his children. For the Hoffmans, mining operation becomes more of and remains a family affair. Hunter joined the show in the sixth season. Prior to that, he expressed his fear of his son, who he says looks like Justin Bieber, being on TV. He doesn’t want him to become like Miley Cyrus and stated that if he allows the fame get into his head, he would pull him from the show. While he has garnered fame and money by striking gold, surprisingly, Hoffman, though he likes gold, does not think there is anything particularly special about the metal. He’s more interested in television and co-founded a production company, ZUM Media. He intends to expand the company into scripted drama and new mining, as well as family-themed reality series. Strangely enough, the bearded gold prospecting maestro sings very well and has dipped his feet into the deep sea of the music industry. He has done a number of cover songs which are available on YouTube. His single, Simple Man is also on iTunes.